(Coppell, TX) – Just in time for Earth Day, AAA announces the 2015 Tesla Model S 70D is the top AAA Green Car. 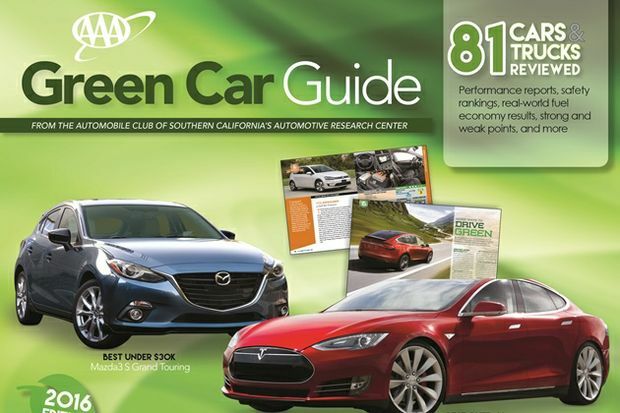 The Tesla is featured with 80 other green vehicles in the 2016 AAA Green Car Guide, a comprehensive report published annually by the largest member of the AAA federation – the Automobile Club of Southern California and its Automotive Research Center. Each of 13 evaluations was scored on 0-10 points. Scores were totaled to determine top vehicles. Each year, the research center tracks significant changes to a vehicle from model year to model year. If no significant changes were made to the power train in 2016, a prior model year’s results were used. The research center’s evaluators divided the vehicles into six categories, crunched the numbers, and identified winners in each category. They also recognized winners by price. The Tesla took three awards – Best Green Car over $50,000, the large car category winner and the top AAA Green Car. In other categories, the best green car under $30,000 was the Mazda 3S Grand Touring, and the best green pickup is the Ford F-150 Supercab Lariat. “Today car shoppers can choose high-quality, zero-to-low-emission vehicles in a growing selection of body type and size and price,” said Megan McKernan, manager of the Automotive Research Center. “Green vehicles also offer drivers a way to save on their energy costs,” she added. A recent AAA member green vehicle survey found that green car issues are important across generations with millennials and non-millennials saying they’d consider buying a green vehicle because of fuel costs and environmental impact. The majority of respondents in the AAA survey also said they are interested in a green vehicle when shopping for a new car and 82 percent said it was important to understand green technology. To help car buyers looking for the latest information on fuel-efficient vehicles and low-emission technology, the sixth annual AAA Green Car Guide reviews battery electric vehicles, compressed natural gas-powered (CNG) vehicles, clean diesels, hybrids, partial zero emission vehicles (PZEVs), and vehicles with high fuel economy. Vehicles were grouped into categories according to size, body type and three price ranges. They were scored by the Los Angeles-based Automotive Research Center in real-world evaluations (acceleration, handling, ride comfort, turning, cargo capacity, etc.). The guide summarizes vehicle specifications, test scores, data and observations and lists vehicle strengths and weaknesses. The report also contains in-depth information about green technologies, vehicle safety and advanced driver assistance systems. The AAA Green Car Guide will be available to AAA members at no charge at select AAA branches starting in May and while supplies last. The guide is available online now at www.AAA.com/greencar.